↑ Potter, Russel A. (1995). Spectacular Vernaculars: Hip-Hop and the Politics of Postmodernism. New York City: State University of New York Press. p. 50. ISBN 0-7914-2626-2. ↑ "Ice Cube produces N.W.A biopic". Filmstarts.de. สืบค้นเมื่อ 2010-10-14. ↑ 3.0 3.1 Erlewine, Stephen Thomas. [เอ็น.ดับเบิลยู.เอ ที่ออลมิวสิก "N.W.A. Biography"] Check |url= value (help). allmusic. สืบค้นเมื่อ 2007-08-17. ↑ White, Miles (2011). From Jim Crow to Jay-Z: Race, Rap and the Performance of Masculinity. Urbana, Illinois: University of Illinois Press. pp. 64, 74. ISBN 978-0-252-03662-0. 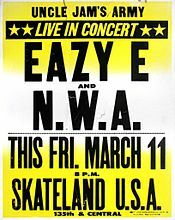 ↑ "NWA Biography". www.nwaworld.com. NWA World. สืบค้นเมื่อ 25 December 2014. ... a self-consciously violent and dangerous lyrical stance ... ridiculously violent and misogynist lyrics. ↑ "Arabian Prince interview". www.huffingtonpost.com. Huffington Post. สืบค้นเมื่อ 16 September 2015. ↑ "Arabian Prince interview". www.vladtv.com. VladTV. สืบค้นเมื่อ 16 September 2015. ↑ "Parental Advisory: Explicit Lyrics - latimes". Articles.latimes.com. 2002-04-14. สืบค้นเมื่อ 2015-07-26. ↑ "The Posse Project". Phoenix New Times. สืบค้นเมื่อ 2011-01-17. ↑ "DJ Yella interview". AftermathMusic.com. สืบค้นเมื่อ 2011-01-17.